I know that a lot of you out there have a secret. And no, it does not involve how many times you’ve read the 50 Shades trilogy. It involves something you are even more reluctant to share. You can’t cook. Despite two cooking channels, Top Chef, and a bazillion magazines, cookbooks, websites and blogs, cooking terrifies you. Whats worse is that you are surrounded by people who can cook. People who love to talk about food. People who not only know the difference between regular and extra virgin olive oil, but people who have spent more on the bottle of olive oil they used to drizzle on the tomato salad than you spent on your whole food budget for the week. Well, help is here. As they say, Fake it Till You Make It! So I am here to help you fake it. Whether or not you make it, is entirely up to you. The easiest way to fake it is to have a few signature dishes that people love so much that every time there is a pot luck or you entertain, people expecting you to make that dish. or of course, a cocktail. So lets start with something easy- Sangria. Sangria is easy, tasty and I bet that with a little bit of thought you could swap out ingredients all year and have a seasonal Sangria every month. 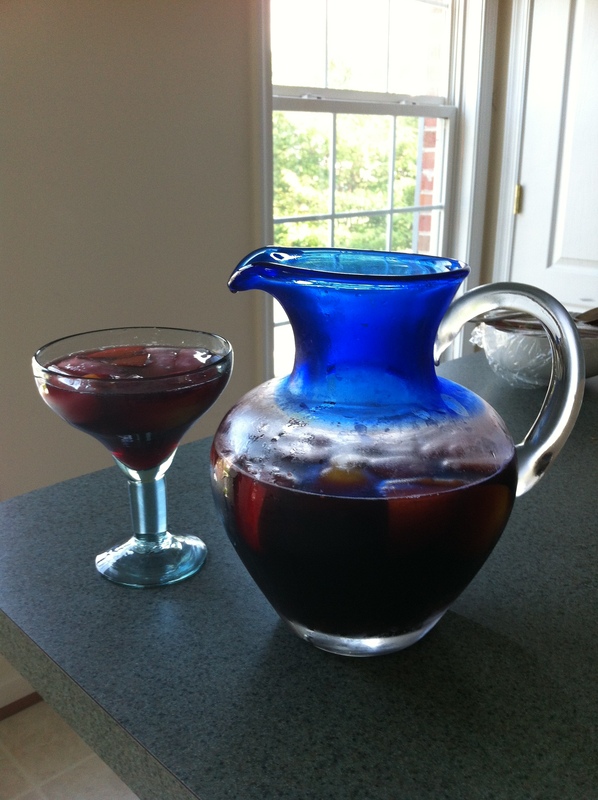 In fact, if I get 5 comments between the blog, Facebook, Twitter and Pinterest, I will even feature the Sangria of the Month, using the ingredients that are freshest or best symbolize the month. In August the peaches are at their best. In fact I am sure that there is a law stating that when fresh peaches are in season, you are required to eat one every day. If not, I will run for President in 2016 and make it part of my platform. 5. Prior to serving, add sparkling water. And look at that. Add a veggie and dip platter, and maybe some cheese and sliced baguette (the thin loaves of bread) and you have a party right there. And the fact you bought the veggies, dip, cheese and baguette from the grocery store pre made and put them on your own plates and hid the evidence in the garbage?